On Wednesday, Marc Lamont Hill, a political commentator on CNN, delivered a speech to the United Nations in support of the Palestinian people. He advocated for their human rights, outlined how Israel denies Palestinians their basic liberties, and asked the international community to ‘commit to political action’. This news is appalling. We are demanding that CNN reinstate Marc Lamont Hill because advocating for Palestinian rights should NOT be a fireable offense. 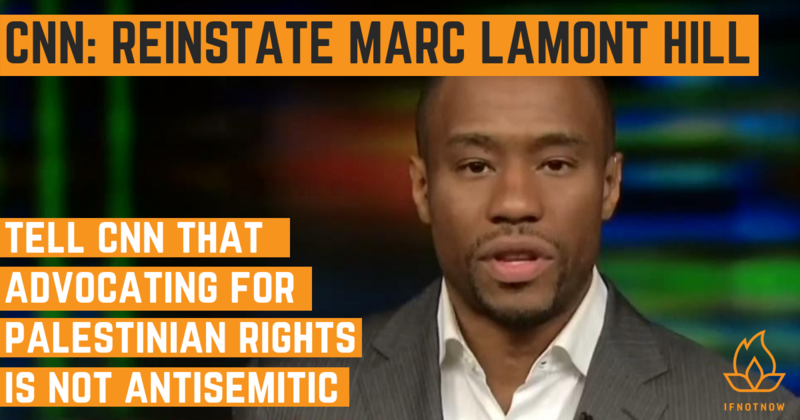 In supporting Palestinian freedom, Marc Lamont-Hill was in no way being anti-semitic. Marc Lamont Hill has spent much of his life fighting against racism and oppression in America. In a tweet responding to accusations against him, he said “I support Palestinian freedom. I support Palestinian self-determination. I am deeply critical of Israeli policy and practice. I do not support anti-Semitism, killing Jewish people, or any of the other things attributed to my speech. I have spent my life fighting these things”. Especially in the Trump Era, it is dangerous to link advocating for Palestinian rights to anti-semitism. It distracts from real threats to Jewish community — the rise of white nationalism. Just imagine being fired because you gave a speech that criticized Israel’s policy of Occupation and declared that Palestinian deserve basic human rights. That is why we as Jews are saying it is not antisemitic to demand freedom for the Palestinian people, and advocating for Palestinian human rights should not be a fireable offense. We need a future where no one lives in fear of being fired for talking about Palestinian human rights and liberation. Demanding freedom and dignity for all Palestinians can also include demanding an end to antisemitism and white nationalism. CNN, we call on you to reinstate Marc Lamont Hill immediately. If Not Now is a movement within the American Jewish community, across generations and organizational affiliations. It is open to any who seek to shift the American Jewish public away from the status quo that upholds the occupation. This entry was posted in MRSCP and tagged Free Speech, Human Rights, Israel Lobby, Take Action by admin. Bookmark the permalink.